The International Space Station as seen from the departing Space Shuttle Discovery during STS-119. The International Space Station (ISS) is a research facility currently being assembled in Low Earth Orbit. 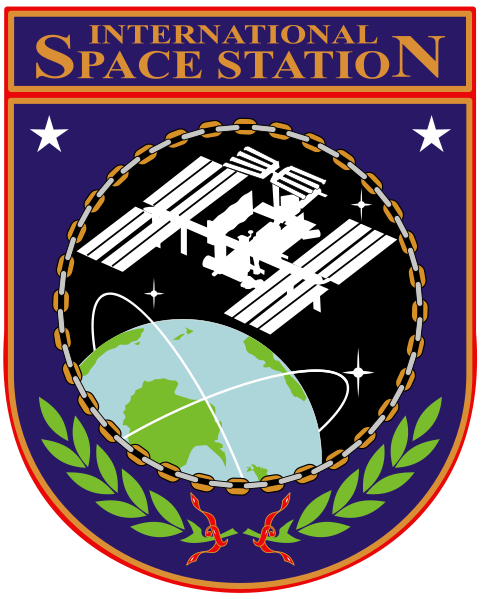 On-orbit construction of the station began in 1998 and is scheduled to be complete by 2011, with operations continuing until at least 2015. 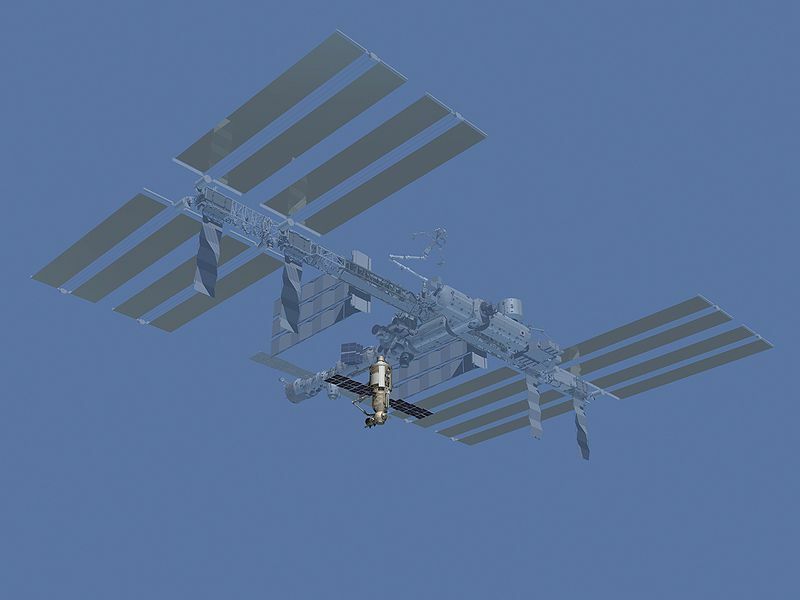 As of 2009, the ISS is the largest artificial satellite in Earth orbit, larger than any previous space station. The ISS is a joint project among the space agencies of the United States (National Aeronautics and Space Administration - NASA), Russia (Russian Federal Space Agency - RKA), Japan (Japan Aerospace Exploration Agency - JAXA), Canada (Canadian Space Agency - CSA) and ten European nations (European Space Agency - ESA). The Brazilian Space Agency (AEB) participates through a separate contract with NASA. The Italian Space Agency (ASI) similarly has separate contracts for various activities not done within the framework of ESA's ISS projects (where Italy also fully participates). China has reportedly expressed interest in the project, especially if it would be able to work with the RKA, although as of 2009 it is not involved. 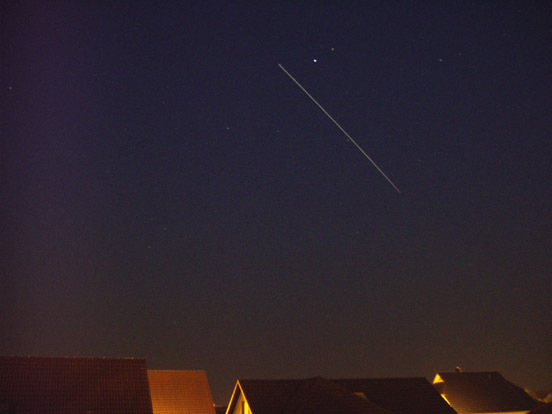 The space station can be seen from Earth with the naked eye. It orbits at an altitude of approximately 350 kilometres (220 mi; 190 nmi) above the surface of the Earth, travelling at an average speed of 27,724 kilometres (17,227 mi) per hour, completing 15.7 orbits per day. The ISS has been continuously staffed since the first resident crew, Expedition 1, entered the station on 2 November 2000. This has provided a permanent human presence in space for the last &0000000000000008.0000008 years, &0000000000000240.000000240 days. Prior to May 2009, the station had the capacity for a crew of three. However, to fulfil an active research programme, since the arrival of Expedition 20, it has been staffed by a resident crew of six. The crew of Expedition 20 is currently aboard. Early crew members all came from the American, Russian and Canadian space programmes until German ESA astronaut Thomas Reiter joined the Expedition 13 crew in July 2006, becoming the first crew member from another space agency. The station has been visited by astronauts from 16 different nations, and it was the destination of the first six space tourists. 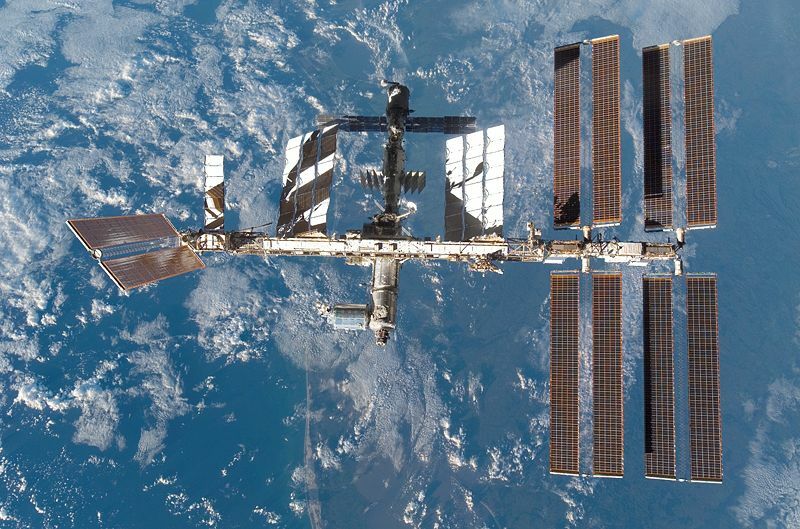 The International Space Station serves primarily as a research laboratory and is the largest ever launched into orbit. The station offers an advantage over spacecraft such as NASA's Space Shuttle because it is a long-term platform in the space environment, allowing long-duration studies to be performed, both on specific experiments and on the human crews that operate them. The presence of a permanent crew also means that the station offers benefits over other unmanned spacecraft as experiments can be monitored, replenished, repaired or replaced as required by the crew, as can various other components of the spacecraft itself. This means that scientists on the ground have swift access to their data and can modify experiments or fly new ones as and when required, benefits generally unavailable on specialised unmanned spacecraft. Crews flying long-term expeditions, lasting several months, conduct science daily (approximately 160 man-hours a week) across a wide variety of fields, including human research, life sciences, physical sciences, and Earth observation, as well as education and technology demonstrations. As of June 2006, 90 science investigations had been conducted on the ISS over 64 months of continuous research. In addition, there have been nine research racks and more than 7,700 kg (17,000 lb) of research equipment and facilities launched to the station. Scientific findings, in fields ranging from basic science to exploration research, are being published every month. One of the main goals of the ISS is to provide a place to conduct experiments that require one or more of the unusual conditions present on the station. The main fields of research include biology, physics, astronomy, and meteorology. 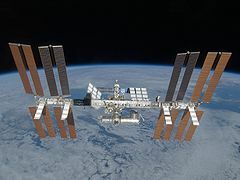 The 2005 NASA Authorization Act designated the US segment of the International Space Station as a national laboratory with a goal to increase the utilisation of the ISS by other Federal entities and the private sector. One research goal is to improve the understanding of long-term space exposure on the human body. Subjects currently being studied include muscle atrophy, bone loss, and fluid shifts. The data obtained from these studies will be used to make space colonisation and lengthy human spaceflight feasible. At the present time, current levels of bone loss and muscular atrophy would pose a significant risk of fractures and movement problems if astronauts landed on a planet following a lengthy space cruise. The effect of near-weightlessness on non-human subjects is being considered as well. Researchers are investigating the relation of the near-weightless environment of outer space to evolution, development and growth, and the internal processes of plants and animals. In response to some of this data, NASA wants to investigate microgravity's effects on the growth of three-dimensional, human-like tissues, and the unusual protein crystals that can be formed in space. Researchers are investigating the physics of fluids in microgravity, enabling them to better model the behaviour of fluids in the future. Due to the ability to almost completely combine fluids in microgravity, physicists are interested in investigating the combinations of fluids that will not normally mix well on Earth. In addition, by examining reactions that are slowed down by low gravity and temperatures, scientists also hope to gain new insight regarding superconductivity. Materials processing takes up a large fraction of the research time aboard the station, aiming to improve techniques used on the ground in order to reap economic benefits. Experiments are intended to provide a better understanding of the relationship between processing, structure, and properties so the conditions required on Earth to achieve desired materials properties can be reliably predicted. Other areas of interest include the effect of the low gravity environment on combustion, studying the efficiency of burning and control of emissions & pollutants. These findings may improve our understanding of energy production, and in turn have an economic and environmental impact. There are also plans to use the ISS to examine aerosols, ozone, water vapour, and oxides in Earth's atmosphere, as well as cosmic rays, cosmic dust, antimatter, and dark matter in the universe. One component assisting in these various studies is the ExPRESS Logistics Carrier (ELC). Developed by NASA, there are currently 4 of these units set to be launched to the ISS. As currently envisioned, the ELCs will be delivered on two separate Space Shuttle missions. They will allow experiments to be deployed and conducted in the vacuum of space, and will provide the necessary electricity and computing to process experimental data locally. Delivery is currently scheduled for STS-129 in November 2009 and STS-133 in May 2010. The Alpha Magnetic Spectrometer (AMS), a particle physics experiment, is also scheduled to be added to the station. 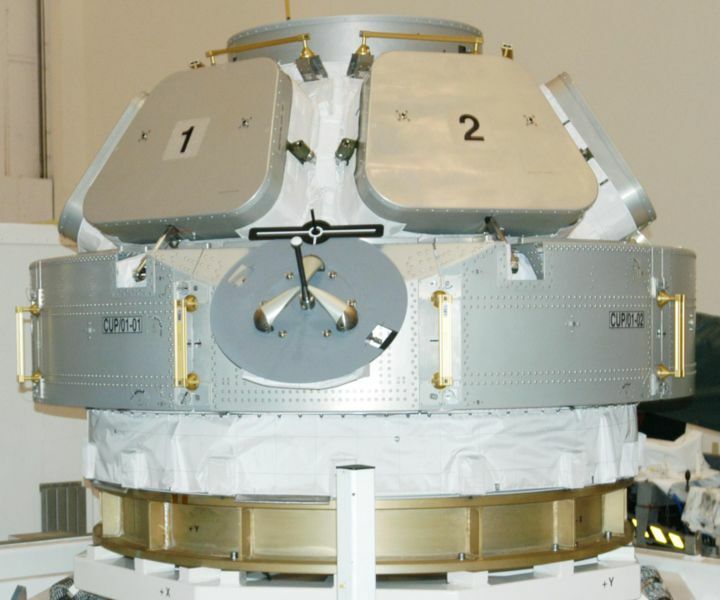 This device will be launched on STS-134 in 2010, and will be mounted externally on the Integrated Truss Structure. The AMS will search for various types of unusual matter by measuring cosmic rays. The experiments conducted will help researchers study the formation of the universe, and search for evidence of dark matter and antimatter. Space Shuttle Atlantis docked to Mir on STS-71, during the Shuttle-Mir Programme. 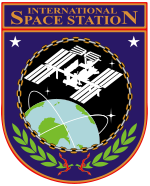 Originating during the Cold War, the International Space Station represents a union of several space station projects from various nations. During the early 1980s, NASA had planned to launch a modular space station called Freedom as a counterpart to the Soviet Salyut and Mir space stations. 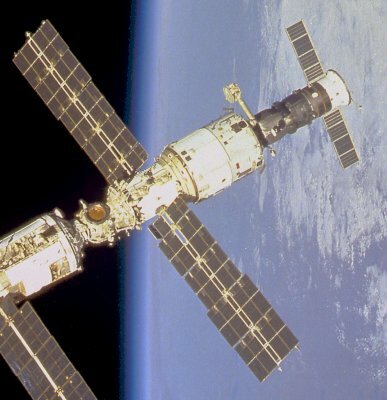 In addition, the Soviets were planning a replacement for Mir to be constructed during the 1990s called Mir-2. Due to budget and design constraints, however, Freedom never progressed past mock-ups and minor component tests. In June 1992, U.S. president George H. W. Bush and Russian president Boris Yeltsin agreed to cooperate on space exploration by signing the Agreement between the United States of America and the Russian Federation Concerning Cooperation in the Exploration and Use of Outer Space for Peaceful Purposes. This agreement called for setting up a short, joint space programme, during which one U.S. astronaut would board the Russian space station Mir and two Russian cosmonauts would board a space shuttle. 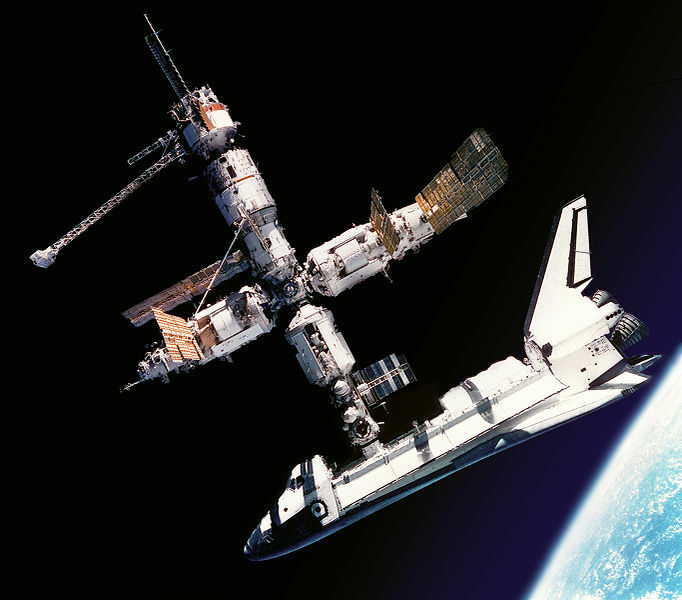 The ISS programme was planned to combine the proposed space stations of all participating space agencies, including Freedom, Mir-2 (with DOS-8 later becoming Zvezda), ESA's Columbus, and the Japanese Kibō laboratory. 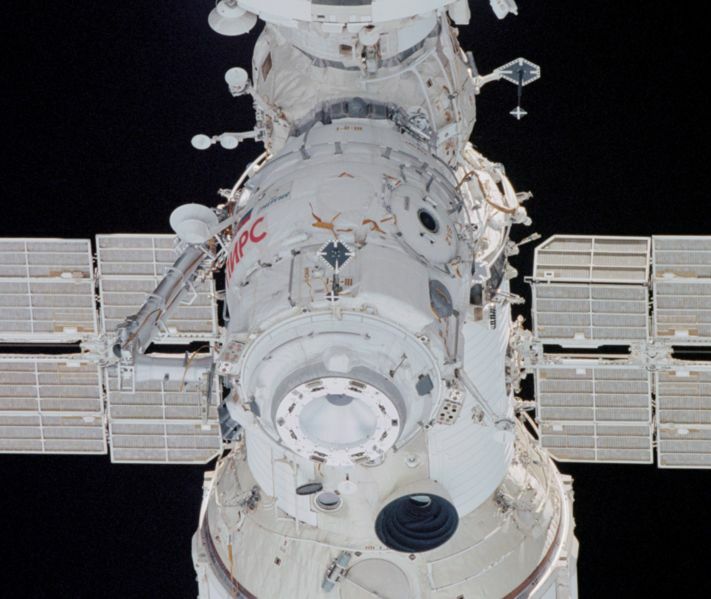 When the first module, Zarya, was launched in 1998, the station was expected to be completed by 2003. Due to delays, however, the estimated completion date has been put back to 2011. 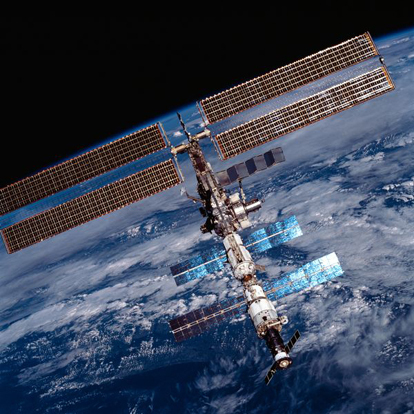 The assembly of the International Space Station, a major aerospace engineering endeavour, began in November 1998. As of March 2009 the station is approximately 81% complete. 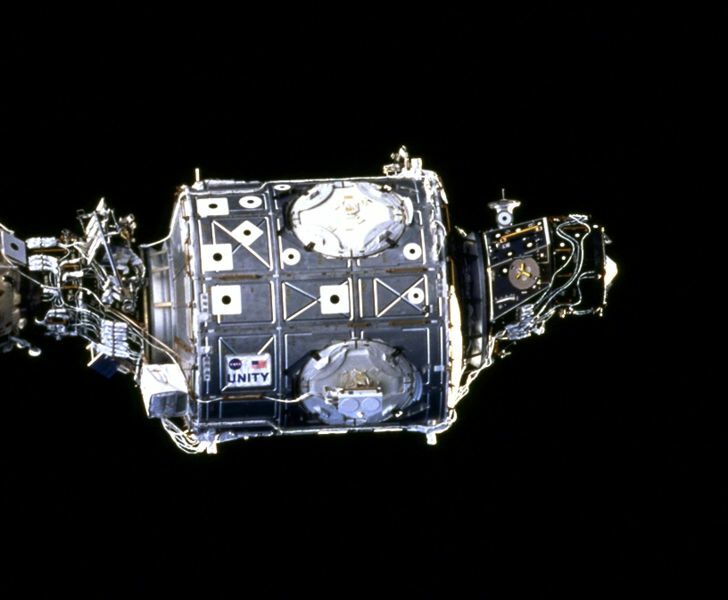 The first segment of the ISS, Zarya, was launched into orbit on 20 November 1998 on a Russian Proton rocket, followed two weeks later by the first of three node modules, Unity, launched aboard STS-88. 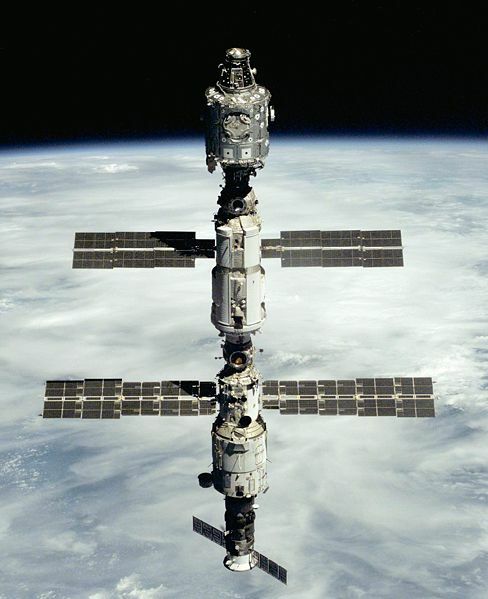 This bare 2-module core of the ISS remained unmanned for the next one and a half years until the Russian module Zvezda was added in July 2000, allowing a maximum crew of three people to occupy the ISS continuously. The first resident crew, Expedition 1, was sent later that year in November. 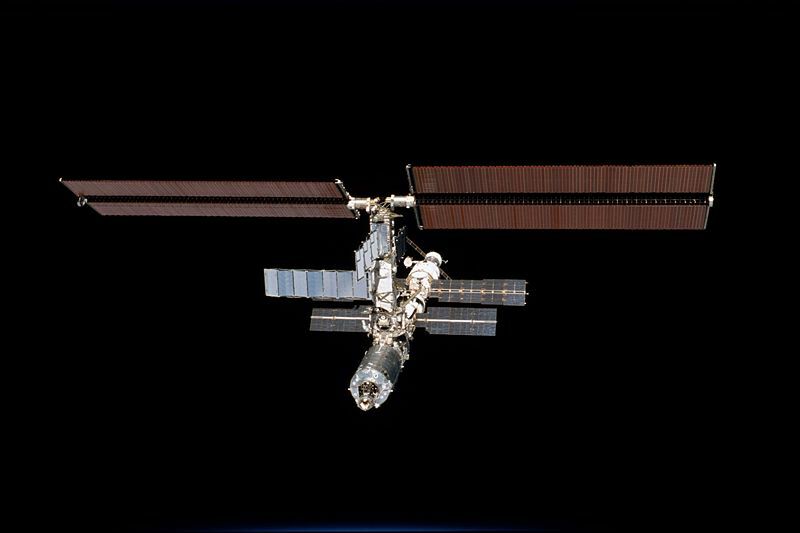 The year 2000 also saw the arrival of two segments of the station's Integrated Truss Structure, the Z1 and P6 trusses, providing the embryonic station with communications, guidance, electrical grounding (on Z1), and power via a pair of solar array wings, located on the P6 truss. Over the next two years the station continued to expand with a Soyuz-U rocket delivering the Pirs docking compartment. Space Shuttles Discovery, Atlantis, and Endeavour delivered the Destiny laboratory and Quest airlock to orbit, in addition to the station's robot arm Canadarm2, and several more segments of the truss structure. The expansion schedule was brought to an abrupt halt, however, following the destruction of the Space Shuttle Columbia on STS-107 in 2003. The resulting hiatus in the Space Shuttle programme halted station assembly until the launch of Discovery on STS-114 in 2005. A video tour of the habitable part of the ISS from January 2009. The official return to assembly was marked by the arrival of Atlantis, flying STS-115, delivering the station's second set of solar arrays. These were later followed by several more truss segments and a third set of arrays on STS-116, STS-117, and STS-118. 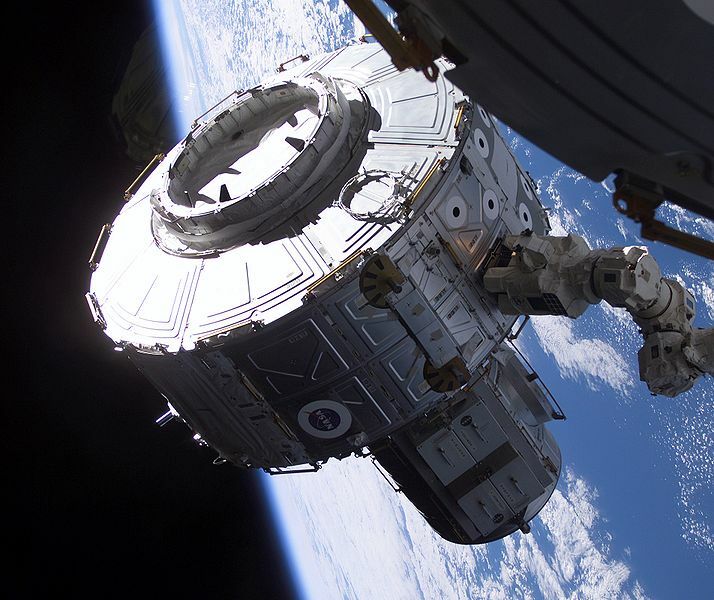 This major expansion of the station's power generating capabilities meant that more pressurised modules could be accommodated, and as a result the Harmony node and Columbus European laboratory were added. These were followed shortly after by the first two components of Kibō, the Japanese Experiment Module. In March 2009, STS-119 marked the completion of the Integrated Truss Structure with the installation of the fourth and final set of solar arrays. As of March 2009, the station consisted of ten pressurised modules and the complete Integrated Truss Structure. Awaiting launch is the final section of Kibō, the third and final American node, Tranquility, the European Robotic Arm and several Russian modules. Also awaiting launch is the Alpha Magnetic Spectrometer (AMS), which is scheduled for launch on what is currently the final space shuttle flight, STS-134, in September 2010. Assembly is expected to be completed by 2011, by which point the station will have a mass in excess of 400 metric tons (440 short tons). When completed, the ISS will consist of fourteen pressurised modules with a combined volume of around 1,000 m³. These modules include laboratories, docking compartments, airlocks, nodes and living quarters. Ten of these components are already in orbit, with the remaining four awaiting launch. Each module was or will be launched either by the Space Shuttle, Proton rocket or Soyuz rocket. The first component of the ISS to be launched, Zarya provided electrical power, storage, propulsion, and guidance during initial assembly. The module now serves as a storage compartment, both inside the pressurised section and in the externally mounted fuel tanks. 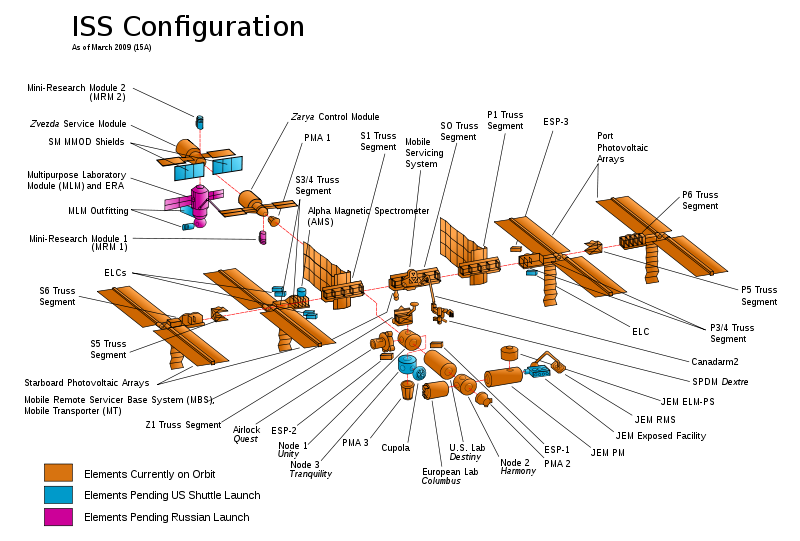 The first node module, connecting the American section of the station to the Russian section (via PMA-1), and providing berthing locations for the Z1 truss, Quest airlock, Destiny laboratory and Tranquility node. The station's service module, which provides the main living quarters for resident crews, environmental systems and attitude and orbit control. The module also provides docking locations for Soyuz spacecraft, Progress spacecraft and the Automated Transfer Vehicle, and its addition rendered the ISS permanently habitable for the first time. The primary research facility for US payloads aboard the ISS, Destiny provides a research facility for general experiments. The module houses 24 International Standard Payload Racks, some of which are used for environmental systems and crew daily living equipment, and features a 20-inch (51 cm) optically perfect window, the largest such window ever produced for use in space. Destiny also serves as the mounting point for most of the station's Integrated Truss Structure. The primary airlock for the ISS, Quest hosts spacewalks with both US EMU and Russian Orlan spacesuits. 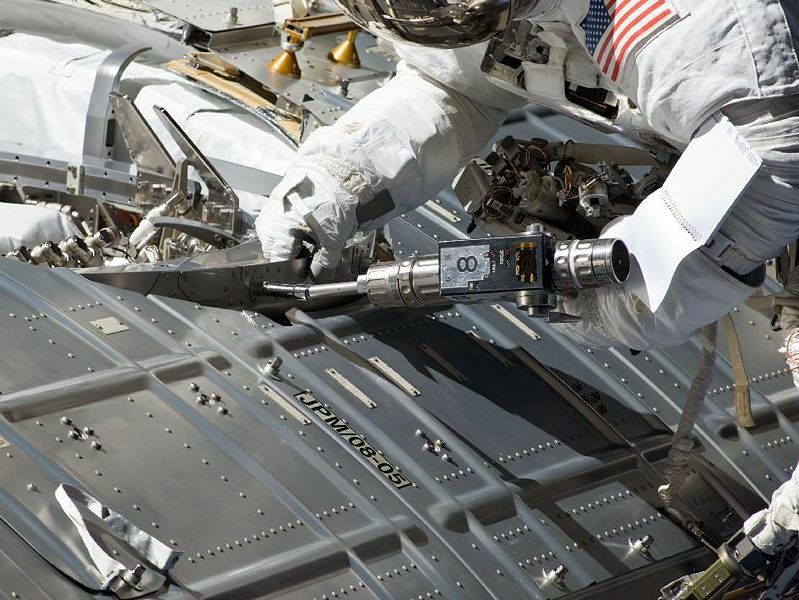 Quest consists of two segments; the equipment lock, that stores spacesuits and equipment, and the crew lock, from which astronauts can exit into space. 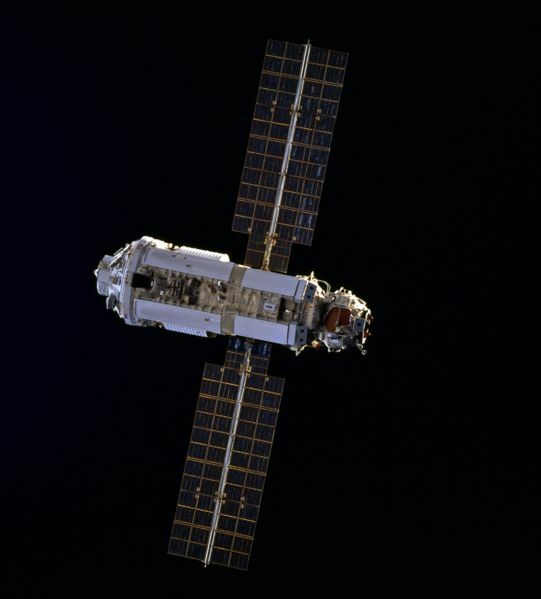 The second of the station's node modules, Harmony is the utility hub of the ISS. The module contains four racks that provide electrical power, bus electronic data, and acts as a central connecting point for several other components via its six Common Berthing Mechanisms (CBMs). 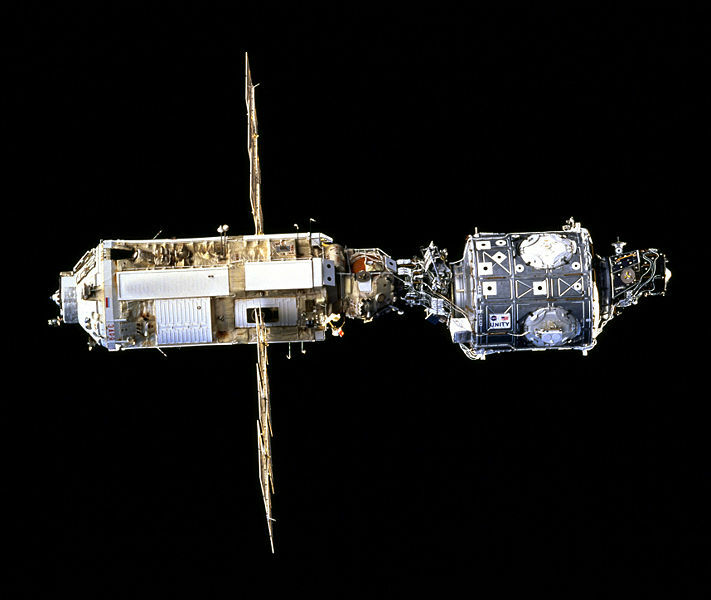 The European Columbus and Japanese Kibō laboratories are permanently berthed to the module, and US Space Shuttle Orbiters dock to the ISS via PMA-2, attached to Harmony's forward port. In addition, the module serves as a berthing port for the Multi-Purpose Logistics Modules during shuttle logistics flights. The primary research facility for European payloads aboard the ISS, Columbus provides a generic laboratory as well as facilities specifically designed for biology, biomedical research and fluid physics. Several mounting locations are affixed to the exterior of the module, which provide power and data to external experiments such as the European Technology Exposure Facility (EuTEF), Solar Monitoring Observatory, Materials International Space Station Experiment, and Atomic Clock Ensemble in Space. A number of expansions are planned for the module to study quantum physics and cosmology. One of the Russian ISS components, MRM2 will be used for docking of Soyuz and Progress ships, as an airlock for spacewalks and as an interface for scientific experiments. The third and last of the station's US nodes, Tranquility will contain an advanced life support system to recycle waste water for crew use and generate oxygen for the crew to breathe. 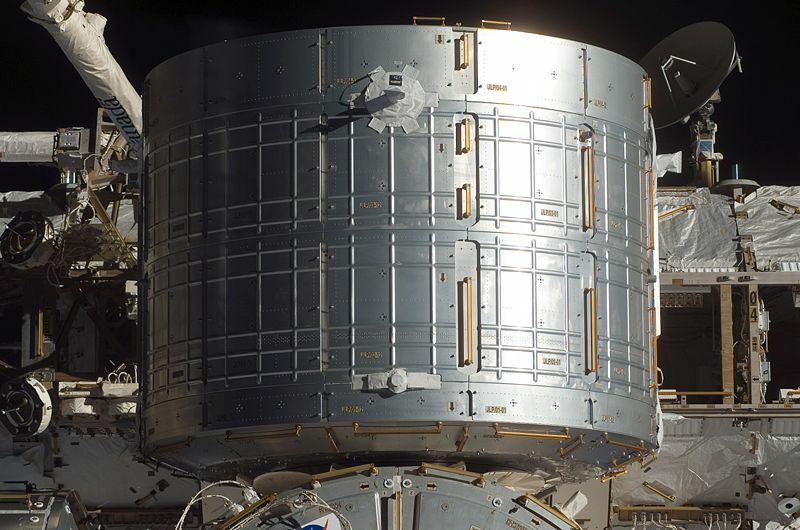 The node also provides four berthing locations for more attached pressurised modules or crew transportation vehicles, in addition to the permanent berthing location for the station's Cupola. Several planned pressurised modules have been cancelled, including the Centrifuge Accommodations Module, for producing varying levels of artificial gravity, the Habitation Module, which was to serve as the station's living quarters (sleep stations are now spread throughout the station), and several Russian modules, including two Russian Research Modules, planned to be used for general experimentation. The source of electrical power for the ISS is the Sun. Light is converted into electricity through the use of solar arrays. Before assembly flight 4A (space shuttle mission STS-97, launched 30 November 2000) the only power sources were the Russian solar panels attached to the Zarya and Zvezda modules. The Russian segment of the station uses 28 volts DC, as does the space shuttle. In the remainder of the station, electricity is provided by the solar arrays attached to the truss at a voltage ranging from 130 to 180 volts DC. These arrays are arranged as four pairs of wings, and each pair is capable of generating nearly 32.8 kW of DC power. Power is stabilised and distributed at 160 volts DC before being converted to the user-required 124 volts DC. This high-voltage distribution line allows for smaller power lines, thus reducing weight. Power can be shared between the two segments of the station using converters. This feature has become essential since the cancellation of the Russian Science Power Platform because the Russian segment now depends on the US-built solar arrays for power. The solar arrays normally track the Sun to maximise the amount of solar power. Each array is about 375 m (450 yd) in area and 58 metres (190 ft) long. In the complete configuration, the solar arrays track the sun in each orbit by rotating the alpha gimbal, while the beta gimbal adjusts for the angle of the sun from the orbital plane. Until the main truss structure arrived, the arrays were in a temporary position perpendicular to the final orientation. In this configuration, as shown in the image to the right, the beta gimbal was used for the main solar tracking. Another tracking option, the Night Glider mode, can be used to reduce the effects of drag produced by the tenuous upper atmosphere, through which the station flies, by orienting the solar arrays edgewise to the velocity vector. The attitude (orientation) of the station is maintained by either of two mechanisms. 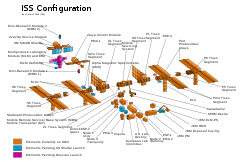 Normally, a system using several control moment gyroscopes (CMGs) keeps the station oriented, with Destiny forward of Unity, the P truss on the port side, and Pirs on the earth-facing (nadir) side. When the CMG system becomes saturated—a situation whereby a CMG exceeds its operational range or cannot track a series of rapid movements—it can lose its ability to control station attitude. In this event, the Russian attitude control system is designed to take over automatically, using thrusters to maintain station attitude, allowing the CMG system to desaturate. This scenario has only occurred once, during Expedition 10. 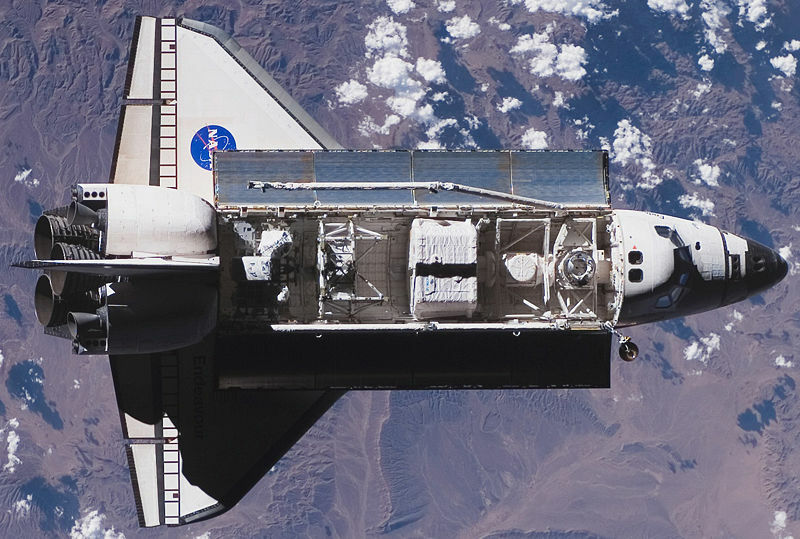 When a space shuttle is docked to the station, it can also be used to maintain station attitude. 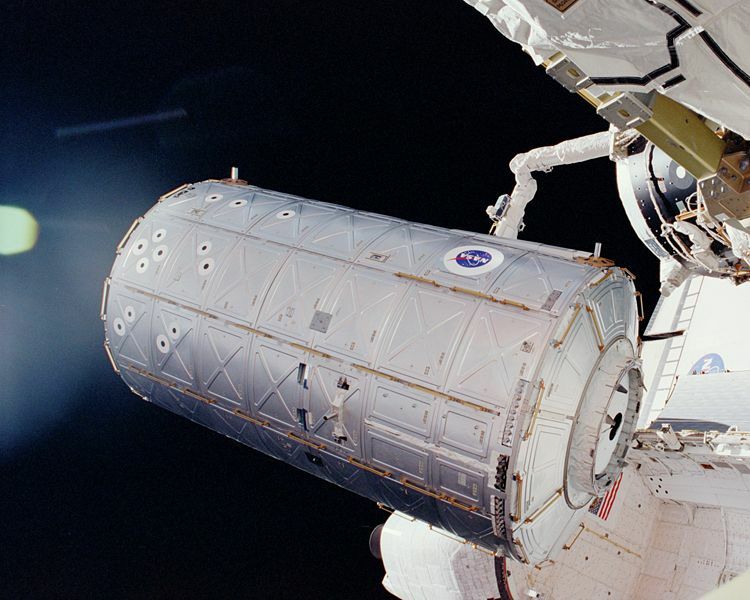 This procedure was used during STS-117 as the S3/S4 truss was being installed. The ISS is maintained at an orbit from a minimum altitude of 278 km (173 mi) to a maximum of 460 km (286 mi). The normal maximum limit is 425 km (264 mi) to allow Soyuz rendezvous missions. As the ISS constantly loses altitude because of slight atmospheric drag, it needs to be boosted to a higher altitude several times each year. These effects vary from day to day, however, because of changes in the density of the outer atmosphere caused by changes in solar activity. This reboost can be performed by the station's two main engines on the Zvezda service module, a docked space shuttle, a Progress resupply vessel, or by ESA's ATV. It takes approximately two orbits (three hours) to be boosted several kilometres higher. In December 2008 NASA signed an agreement with the Ad Astra Rocket Company which may result in the testing on the ISS of a VASIMR plasma propulsion engine. This technology could, in the future, allow station-keeping to be done much more economically than at present. The spatial separation from the real centre of mass of the ISS—any part of the ISS not at the exact centre of mass will tend to follow its own orbit. However, as each point is physically part of the station, this is impossible, and so each component is subject to small accelerations from the forces which keep them attached to the station as it orbits. This is also called the tidal force. 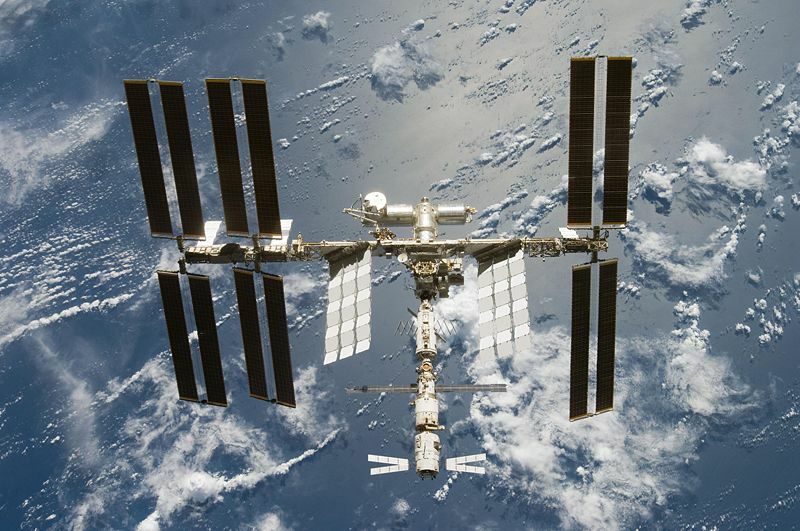 The ISS Environmental Control and Life Support System (ECLSS) provides or controls elements such as atmospheric pressure, fire detection and suppression, oxygen levels, and water supply. The highest priority for the ECLSS is the ISS atmosphere, but the system also collects, processes, and stores waste and water produced and used by the crew. This process includes recycling fluid from the sink, shower, toilet, and condensation from the air. The Elektron system aboard Zvezda and a similar oxygen generation system in Destiny generate oxygen aboard the station. If required, the crew has a backup option in the form of bottled oxygen and Solid Fuel Oxygen Generation (SFOG) canisters. Carbon dioxide is removed from the air by the Vozdukh system in Zvezda. Other by-products of human metabolism, such as methane from the intestines and ammonia from sweat, are removed by activated charcoal filters. 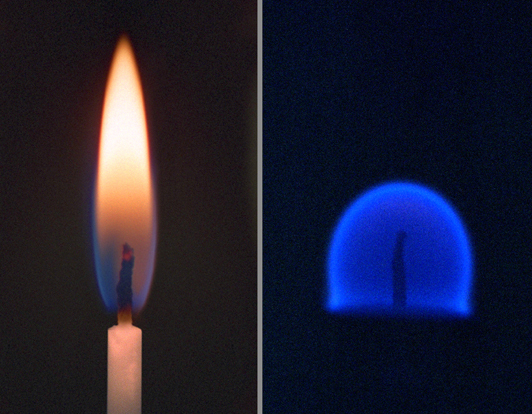 The atmosphere on board the ISS is maintained to have a composition similar to that of the Earth's atmosphere. 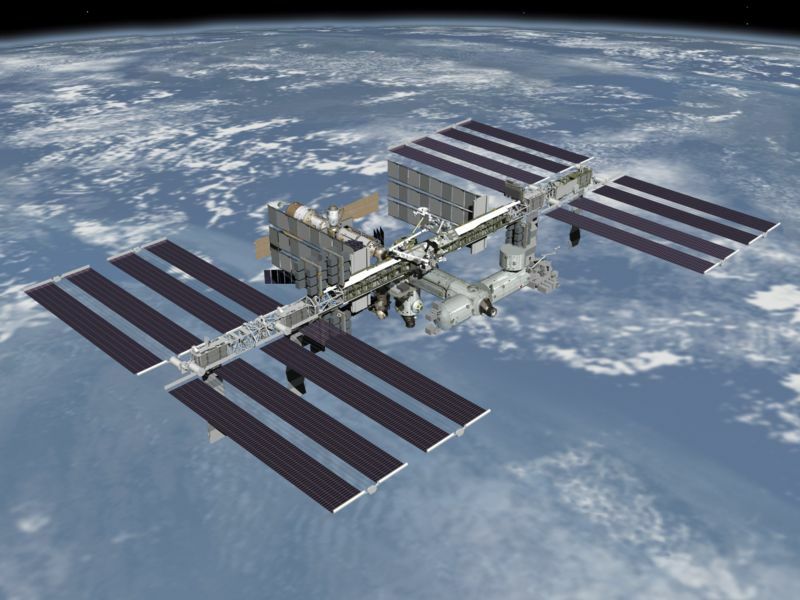 Normal air pressure on the ISS is 101.3 kPa (14.7 psi), the same as at sea level on Earth. Whilst this type of atmosphere offers various benefits for crew comfort, an Earthlike atmosphere is also much safer than the alternative, a pure oxygen atmosphere, due to the increased risk of fire, responsible for the deaths of the Apollo 1 crew. 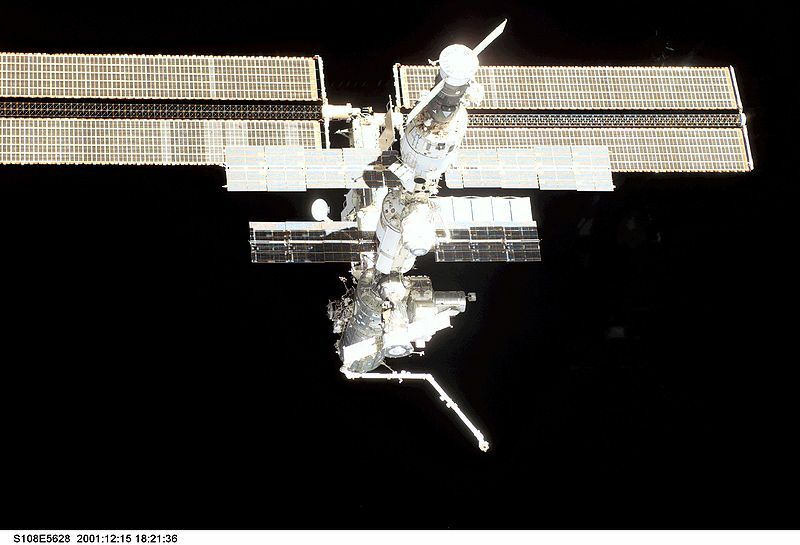 Because of the size of the International Space Station (about that of an American football field) and the large reflective area offered by its solar panels, ground based observation of the station is possible with the naked eye if the observer is in the right location at the right time—in many cases, the station is one of the brightest naked-eye objects in the sky, although it is visible only for brief periods of time, ranging from two to five minutes. In order to view the station, the following conditions need to be fulfilled, assuming the weather is clear: The station must be above the observer's horizon, and it must pass within about 2000 km of the observing site (the closer the better); it must be dark enough at the observer's location for stars to be visible; and the station must be in sunlight rather than in the Earth's shadow. It is common for the third condition to begin or end during what would otherwise be a good viewing opportunity. In the evening, this will cause the station to suddenly fade and disappear as it moves further from the dusk, going from west to east. In the reverse situation, it may suddenly appear in the sky as it approaches the dawn. The station has now become bright enough to be seen during the day under certain conditions. 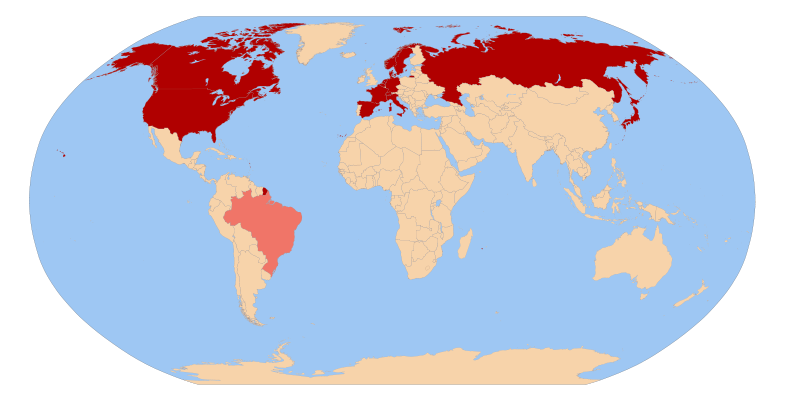 Primary contributing nations. NASA contracted nations. 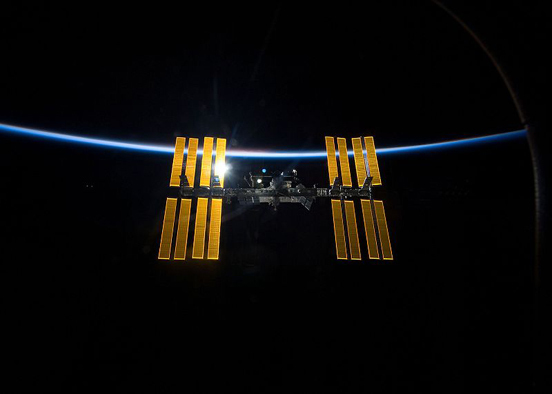 As a multinational project, the legal and financial aspects of the ISS are complex. Issues of concern include the ownership of modules, station utilisation by participating nations, and responsibilities for station resupply. The main legal document establishing obligations and rights between the ISS partners is the Space Station Intergovernmental Agreement (IGA). This international treaty was signed on 28 January 1998 by the primary nations involved in the Space Station project: the United States, Russia, Japan, Canada, Belgium, Denmark, France, Germany, Italy, the Netherlands, Norway, Spain, Sweden and Switzerland. This set the stage for a second layer of agreements, called Memoranda of Understanding (MOU), between NASA and ESA, CSA, RKA and JAXA. These agreements are then further split, such as for the contractual obligations between nations, and trading of partners rights and obligations. Use of the Russian Orbital Segment is also negotiated at this level. Crew time, electrical power and rights to purchase supporting services (such as data upload and download and communications) are divided 76.6% for NASA, 12.8% for JAXA, 8.3% for ESA, and 2.3% for CSA. In addition to these main intergovernmental agreements, Brazil has a contract with NASA to supply hardware. In return, NASA will fly one Brazilian to the station during the ISS programme. Italy also has a separate contract with NASA to provide similar services, although Italy also takes part in the programme directly via its membership in the ESA. The most cited figure of an overall cost estimate for the ISS ranges from 35 billion to 100 billion USD. ESA, the only agency actually stating potential overall costs, estimates €100 billion for the entire station over a period of 30 years. Giving a precise cost estimate for the ISS is not straightforward, as it is difficult to determine which costs should actually be attributed to the ISS programme, or how the Russian contribution should be measured. 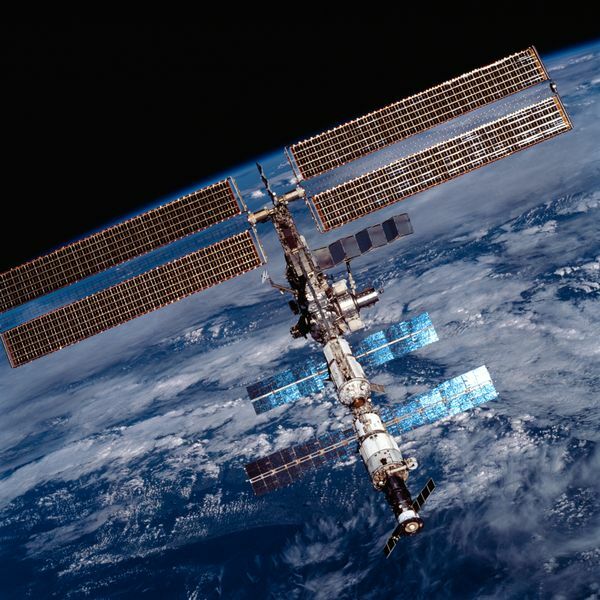 The International Space Station has been the target of varied criticism over the years. 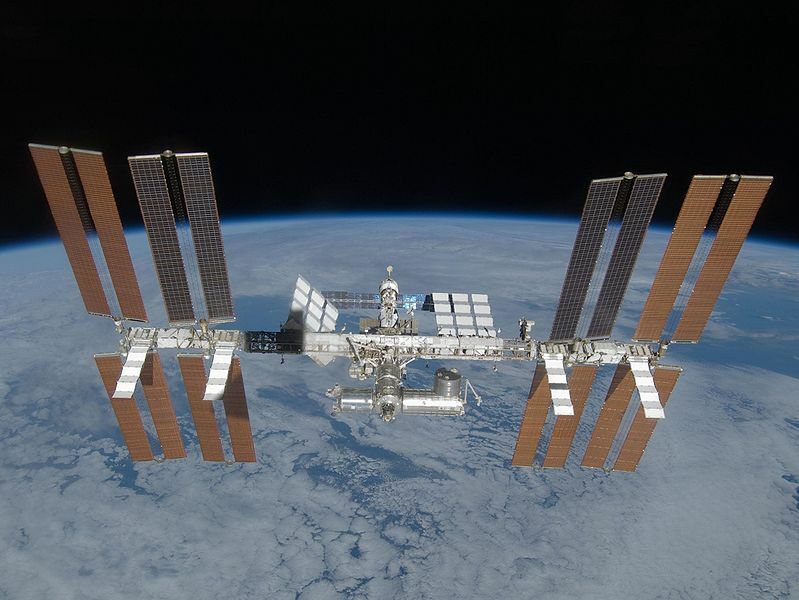 Critics contend that the time and money spent on the ISS could be better spent on other projects—whether they be robotic spacecraft missions, space exploration, investigations of problems here on Earth, or just tax savings. Some critics, such as Robert L. Park, argue that very little scientific research was convincingly planned for the ISS in the first place, and that the primary feature of a space-based laboratory, its microgravity environment, can be studied more cheaply with a "vomit comet". The research capabilities of the ISS have been criticised, particularly following the cancellation of the ambitious Centrifuge Accommodations Module, which, alongside other equipment cancellations, means research done on the ISS is generally limited to experiments which do not require any specialized apparatus. 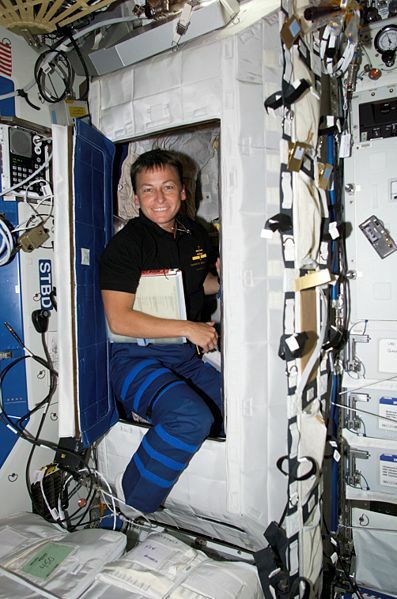 For example, in the first half of 2007, ISS research dealt primarily with human biological responses to being in space, covering topics like kidney stones, circadian rhythm, and the effects of cosmic rays on the nervous system. Other criticisms hinge on the technical design of the ISS, including the necessity for a high level of maintenance to be carried out by the crew, particularly via risky EVAs, and the high inclination of the station's orbit, which leads to a higher cost for US-based launches to the station. In response to some of these comments, advocates of manned space exploration say that criticism of the ISS project is short-sighted, and that manned space research and exploration have produced billions of dollars' worth of tangible benefits to people on Earth. It has been estimated that the indirect economic return from spin-offs of human space exploration has been many times the initial public investment, however, a review of the claims by the Federation of American Scientists argued that NASA's rate of return from spin-offs is actually very low, except for aeronautics work that has led to aircraft sales. 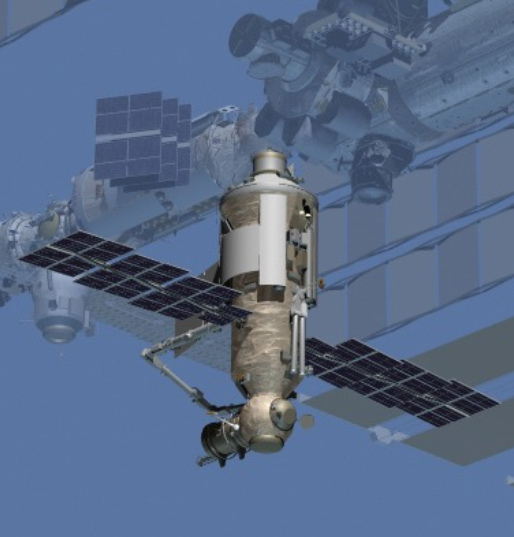 A report in late May 2009 stated that RKK Energia has been asked to look at ways to remove the Russian modules from the station when the end of mission is reached some time between 2015 and 2020. NASA has responsibility for de-orbit and is said to intend this around 2020. As the Russian modules have the motors that would be used for controlled de-orbit, this poses a potential issue if Russia takes that capability to a new, on-going station. Other options include using a European Automated Transfer Vehicle. One option stated for an ongoing station is for Russia to build a ball-shaped, six-port module to which existing modules could be attached. Later modules would also be launched to provide a Russian outpost for later missions to the Moon and Mars. The report quotes an unnamed Russian engineer stated that experience from Mir indicates that, except for micrometeorite damage, a thirty year life should be possible, given that the Russian modules have been built with on-orbit refurbishment in mind. Each permanent station crew is given a sequential Expedition number: Expedition 1, Expedition 2, and so on. Expeditions have an average duration of half a year, and they commence following the official handover of the station from one Expedition commander to another. Expeditions 1 through 6 consisted of three person crews, but the Columbia accident led to a reduction to two crew members from Expeditions 7 to 12. Expedition 13 saw the restoration of the station crew to three, and the station has been permanently staffed as such since. Whilst only three crew members are permanently on the station, however, several expeditions, such as Expedition 16, have consisted of up to six individual astronauts or cosmonauts, with individuals being flown up and down to the station on various individual flights. On May 27, 2009, the current expedition to ISS Expedition 20 began. Expedition 20 is the first ISS crew of six. Before the expansion of the living volume and capabilities from STS-115 the station could only host a crew of three. Expedition 20's crew was lifted to the station in two separate Soyuz-TMA flights launched at two different times (each Soyuz-TMA can hold only three people): Soyuz TMA-14 on March 26, 2009 and Soyuz TMA-15 on May 27, 2009. However, the station will not be permanently occupied by six crew members during all 52 weeks of the year. For example, when the Expedition 20 crew (Roman Romanenko, Frank de Winne and Bob Thirsk) returns to Earth in November 2009, for a period of about two weeks only two crew members (Jeff Williams and Max Surayev) will be aboard. This will increase to five in early December, when another Soyuz, carrying Oleg Kotov, Timothy Creamer and Soichi Noguchi arrives. 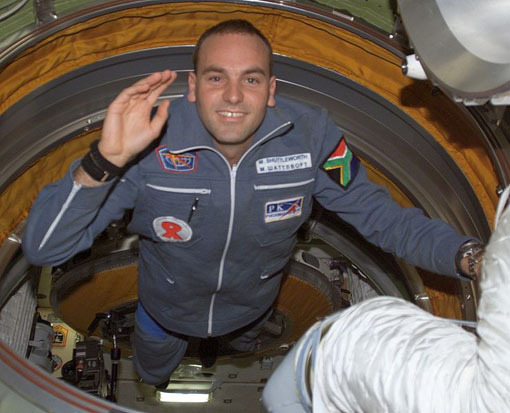 It will then decrease to three when Williams and Surayev depart in March 2010, returning to six in April 2010 with the launch of the next three-person Soyuz. 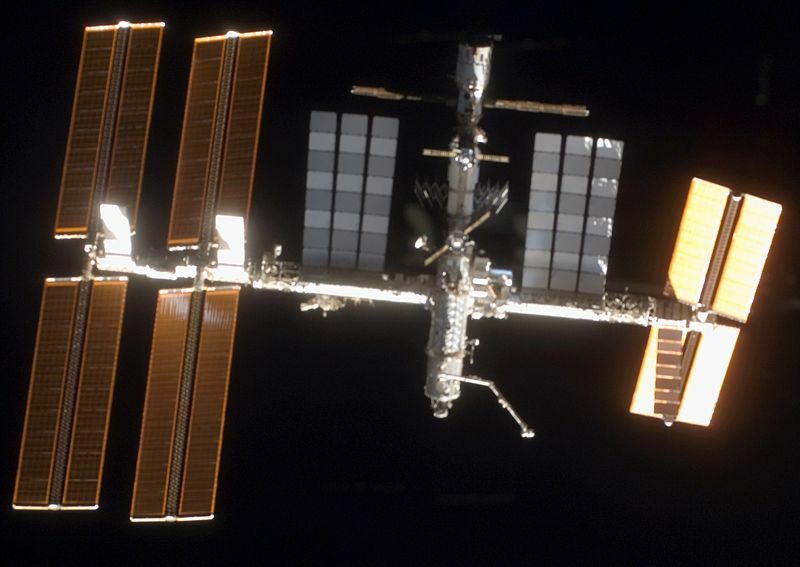 The International Space Station is the most-visited spacecraft in the history of space flight. 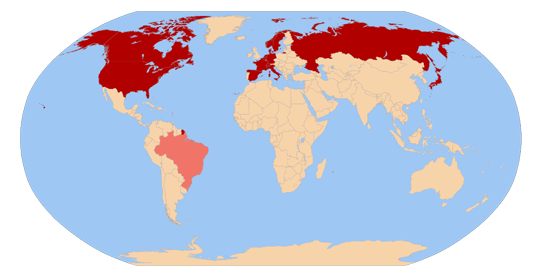 As of 17 November 2008 (2008 -11-17), it has had 213 non-distinct visitors comprising 167 individual people. Mir had 137 non-distinct visitors. The time zone used on board the ISS is Coordinated Universal Time (UTC, sometimes informally called GMT). The windows are covered at night hours to give the impression of darkness because the station experiences 16 sunrises and sunsets a day. During visiting space shuttle missions, the ISS crew will mostly follow the shuttle's Mission Elapsed Time (MET), which is a flexible time zone based on the launch time of the shuttle mission. Because the sleeping periods between the UTC time zone and the MET usually differ, the ISS crew often has to adjust its sleeping pattern before the space shuttle arrives and after it leaves to shift from one time zone to the other in a practice known as sleep shifting. A typical day for the crew begins with a wake-up at 06:00, followed by post-sleep activities and a morning inspection of the station. The crew then breakfasts and takes part in a daily planning conference with Mission Control on the ground before starting work at around 08:10. The first scheduled exercise of the day follows, after which the crew continues work until 13:05. Following a one-hour lunch break, the afternoon consists of more exercise and work before the crew carries out its pre-sleep activities beginning at 19:30, including dinner and a crew conference. The scheduled sleep period begins at 21:30, when the daily schedule is complete. In general, the crew works 10 hours per day on a weekday, and 5 hours on Saturdays, with the rest of the time being their own for relaxation, games or work catch-up. NASA's Mission Control Center at Lyndon B. Johnson Space Center in Houston, Texas, serves as the primary control facility for the US segment of the ISS and also controls the various Space Shuttle missions that visit the station. NASA's Payload Operations and Integration Center at Marshall Space Flight Center in Huntsville, Alabama, serves as the centre that coordinates all payload operations in the US Segment. Roskosmos's TsUP at Korolyov, Moscow, controls the Russian Orbital Segment of the ISS, in addition to individual Soyuz and Progress missions. ESA's Columbus Control Centre at the German Aerospace Centre (DLR) in Oberpfaffenhofen, Germany, controls the European Columbus research laboratory. JAXA's JEM Control Centre and HTV Control Centre at Tsukuba Space Centre (TKSC) in Tsukuba, Japan, are responsible for operating the Japanese Experiment Module complex and all flights of the unmanned Japanese H-II Transfer Vehicle respectively. The Space Shuttle Endeavour approaching the ISS during STS-118. 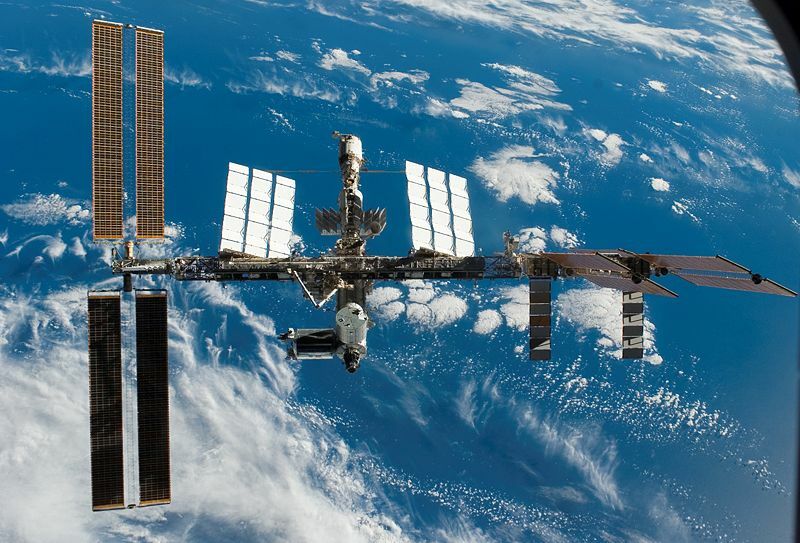 Spacecraft from three different space agencies visit the International Space Station, serving a variety of purposes. The Automated Transfer Vehicle from the European Space Agency has provided resupply services to the station. Also serving the station in this capacity is the Russian Roskosmos Progress spacecraft. In addition, Russia also supplies a Soyuz spacecraft used for crew rotation and emergency evacuation which is replaced every six months. Finally, the United States services the ISS through its Space Shuttle programme. Space shuttle missions provide resupply missions, assembly and logistics flights, and crew rotation. As of 28 March 2009 (2009 -03-28), there have been 18 Soyuz, 32 Progress, 1 ATV and 28 Space Shuttle flights to the station. Expeditions require, on average, 2,722 kg of supplies, and as of 28 March 2009 (2009 -03-28), crews had consumed a total of 19,000 meals. Soyuz crew rotation flights and Progress resupply flights visit the station on average twice three times annually respectively, with the ATV planned to visit annually from 2010 onwards. Soyuz TMA-14 is at the Zvezda Service Module's aft docking port. The spacecraft has brought two members of Expedition 19, Russian Commander Gennady Padalka and American Flight Engineer Michael R. Barratt, to the station, in addition to Spaceflight Participant Charles Simonyi. Progress M-02M is at Pirs's nadir docking port. Used to resupply the ISS, it is the second Progress-M 11F615A60 spacecraft to be flown. Soyuz TMA-15 is at Zarya's nadir docking port. The spacecraft brought three members of Expedition 20, Commander Roman Romanenko and Flight Engineers Frank De Winne and Robert Thirsk, who became the first Canadian to fly aboard a Soyuz spacecraft. 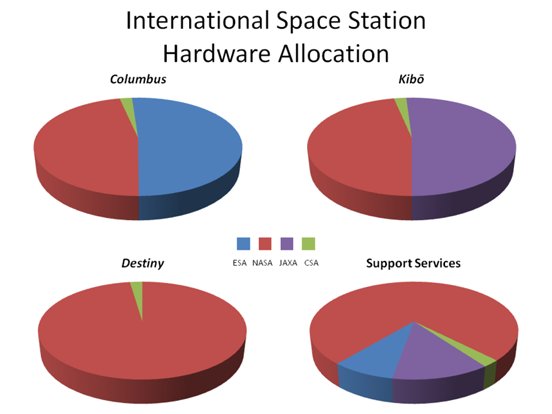 Throughout the remainder of the station's operating life, a variety of spacecraft by various ISS program members are planned with the intent to service the ISS. 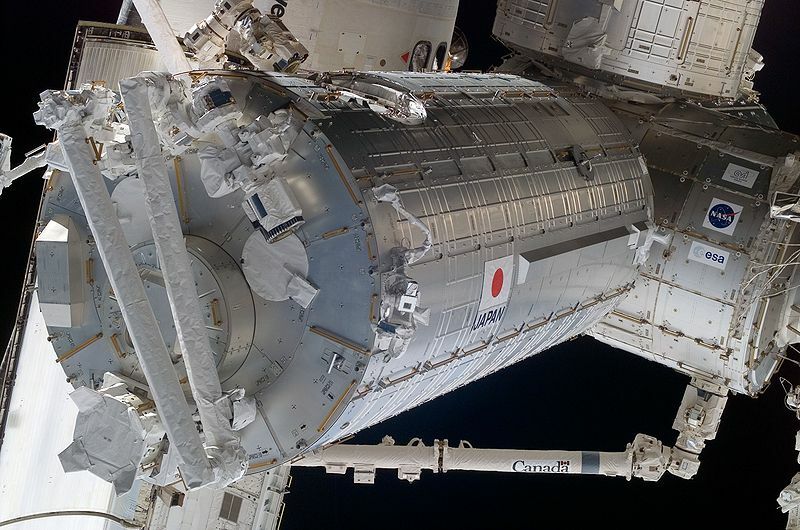 Currently under construction and planned for operation in 2009 is the Japanese H-II Transfer Vehicle (HTV), which is intended as a resupply vehicle for the JAXA Kibō modules. Still in initial funding stages is the Russian Kliper spacecraft, which, if it comes to fruition in 2012 as planned, is intended as a replacement of the Soyuz spacecraft. Being currently designed is the American Orion spacecraft, with plans to launch starting in 2014 as another resupply spacecraft and provide crew rotation. In hopes of bridging the gap between the Space Shuttle and Orion, NASA has started the Commercial Orbital Transportation Services program to develop commercial spacecraft services dedicated to the station. Japanese scientists and origami masters propose to launch a flotilla of paper planes from the ISS in 2009, during STS-127. Around 30 planes will make the descent, each gliding downward over what is expected to be the course of several months. If one of the planes survives to Earth, it will have made the longest flight ever by a paper plane, traversing some 400 km (250 mi), and will have demonstrated the feasibility of slow-speed, low-friction atmospheric reentry. A prototype of the origami aeroplane passed a durability test in a wind tunnel in March 2008, and Japan's space agency adopted it for feasibility studies. During an EVA during Expedition 14, a special golf ball equipped with a tracking device was hit from the station and sent into its own low Earth orbit. The stunt was paid for by Canadian golf equipment manufacturer Element 21. As of April 2009, six space tourists have visited the ISS, each paying around US$25 million. The tourists, or spaceflight participants, were launched and returned via Russian crew rotation missions on Soyuz spacecraft. The ISS was the location of the first space wedding, during which Russian cosmonaut Yuri Malenchenko, flying Expedition 7, married Ekaterina Dmitrieva, who was in Texas at the time. The ISS against the blackness of space and the thin line of Earth's atmosphere, taken from the Space Shuttle Discovery as the two spacecraft begin their separation.